For over 40 years Ritter’s Flowers & Gifts has served Decatur and Adams County's as a full service florist. The building at the intersection of Second, Fifth and Washington streets in Decatur was originally operated as Miller's North End Grocery, dating to the 1920's or 1930's. In September of 1977, James and Kathryn Ritter purchased the building and its contents with plans to open a flower and gift shop. The plan also called for their two adult daughters, Teri Wemhoff and Tami Miller, to operate the shop. Following extensive remodeling and the sale of the building's contents, the business was launched with a Christmas Open House on December 5, 1977. In the late 1980's, Teri left the business to pursue other interests and Ritter's was purchased by Tami and her husband, Max, in February 1989. The business underwent another complete renovation in the early 1990's, and then in the early 2000's was redone with the additions of new porches and additional parking. 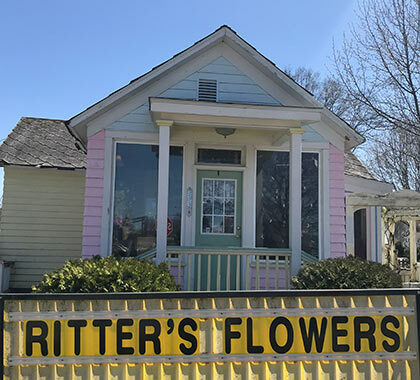 Tami says Ritter's Flowers & Gifts is a full-service florist providing all floral needs for weddings, funerals, parties and special occasions. The business also offers a large selection of gift items and home décor. Local and area delivery is provided as well as worldwide delivery; Ritter's is a longtime member of Teleflora and FTD. The shop currently has five employees, including the Millers' daughter-in-law, Emmie Braun-Miller, and long-time employee Lucinda Wyss, who as worked at the shop since the early 1980's. Over the years Max and Tami have been active in many organizations and local events. Max is well known through his work with the Adams County Historical Society museum in Decatur and the volunteer group Decatur Main Street.